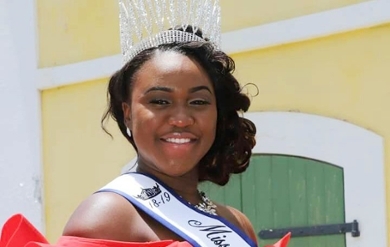 Kendra Kent won the coveted title of Miss University of the Virgin Islands on Saturday, April 14, at the St. Croix Educational Complex Gymnasium on St. Croix. Kent won the ambassadorial competition after competing against two other contestants. In addition to the crown, Kent, a 21-year-old junior criminal justice major, captured three of the five judged segments - Best Ambassadorial Presentation, Best Performing Talent and Best Evening Wear. “I will be actively engaged in the recruitment efforts by visiting the high schools in the Virgin Islands by selling the great story of UVI and its academic programs,” she said. In addition to the UVI crown, Flemming won Best Ambassadorial Presentation and Best Performing Talent. In addition to winning the Miss UVI crown, Ms. Warner won Most Eloquent/Intellectual Speaker, Best Evening Wear, and Best Ambassadorial Presentation. Warner, age 24 is from St. Kitts and attends UVI on the St. Thomas Campus. She is a junior majoring in communications, whose career aspiration is to become a professionally trained journalist, reporter and news anchor. Her platform is ‘The Beauty Myth’, which she dubbed D.R.E.A.M.S. (Developing a Realm of Educated Ambitious Motivated Sisters) and she plans to use her skills as a communication major to strongly promote her platform. Her hobbies and interest include reading, learning foreign languages and writing poetry. Warner said, “I hope to one day follow in the footsteps of my eldest aunt and publish a poetry book”. The Miss UVI Ambassadorial Competition is sponsored by the Student Government Association Queen's Committee. Miss UVI serves as a goodwill ambassador for the University. This role includes but is not limited to participation in UVI's recruitment efforts, representing the University locally and abroad, and maintaining a highly visible role on UVI's campuses on St. Croix and St. Thomas. Katherine Callwood was crowned Miss University of the Virgin Islands 2015-2016 at the 35th Annual Miss UVI Ambassadorial Competition held Saturday, April 11, on the Albert A. Sheen Campus on St. Croix. In addition to winning the Miss UVI crown, Callwood, 26, won Most Eloquent/Intellectual Speaker, Best Evening Wear, and Miss Photogenic. Callwood, a sophomore majoring in early childhood education, said she ran for Miss UVI because she and the University have very similar goals including, promoting education, excellent teaching and community service. Callwood, who attends UVI on the St. Thomas Campus, plans to be the director of her own early education school, which will serve low-income and special needs children. As Miss UVI, she hopes to network and implement strategies that promote UVI and education.